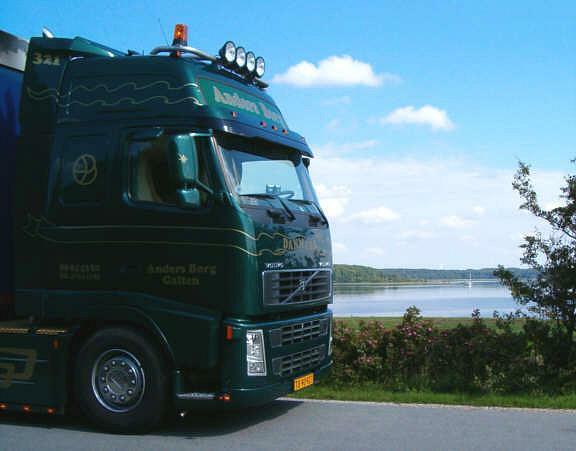 I'm Flemming Andersen (Slipse), a professional truck driver from Denmark. I'll try to show you a litle about my life and passions. I'm 40 years young and living together with my girlfriend Anne, my son Benjamin and our two cats Matilde & Mille. I have been a truckdriver since 1994 I started out on a round trip from Denmark to Spain or Portugal. Reloading in Spain and then off to Greece, tipping and reloading then back to Denmark. In 1995 we started working for another freight dispatching company, specialized in The Balkans, mainly Greece, Bulgaria, Albania and Romania. I had a great time, loads of experiences, but..... In the spring of 2001 I found it was time to stop the longer hauling, and start being a part of my family and our home. I started doing container trucking, but after about a year, I found myself living in my truck all week, left home Sunday evening, and came back on the following Saturday. The rules and regulations regarding driving hours and resting time, along with the tight scedules made by the dispatchers, made it impossible to drive home after a days work. In my new job, I still spend the week in my truck, but the weekends are "real" weekends, from Friday evening to Monday morning. It's a smaller company, with 7 trucks, incl my Boss's own truck. We haul for about 10 different dispatching companies, so the work varyes a lot, and this becomes me. Most of the time we drive in Denmark, but with the occassional trip to Sweeden, Finland or southern Europe. There will be more to come in the near future about my new job. Come along on this trip to Bulgaria, starting in Denmark. I hope you'll enjoy your stay here in my Pages and before you leave, please sign my Guestbook. Should you be interested in using one of my Photo's please refer back to my pages.